Protein phosphorylation is one of the most common post-translational modification processes that play an essential role in regulating protein functionality. The Helicoverpa armigera single nucleopolyhedrovirus (HearNPV) orf2-encoded nucleocapsid protein HA2 participates in orchestration of virus-induced actin polymerization through its WCA domain, in which phosphorylation status are supposed to be critical in respect to actin polymerization. In the present study, two putative phosphorylation sites (232Thr and 250Ser) and a highly conserved Serine (245Ser) on the WCA domain of HA2 were mutated, and their phenotypes were characterized by reintroducing the mutated HA2 into the HearNPV genome. 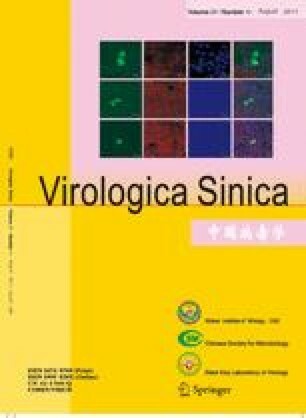 Viral infectivity assays demonstrated that only the recombinant HearNPV bearing HA2 mutation at 245Ser can produce infectious virions, both 232Thr and 250Ser mutations were lethal to the virus. However, actin polymerization assay demonstrated that all the three viruses bearing HA2 mutations were still capable of initiating actin polymerization in the host nucleus, which indicated the putative phosphorylation sites on HA2 may contribute to HearNPV replication through another unidentified pathway. Foundation items: National Nature Science Foundations of China (31030027, 30770085 and 30800044).